Care property Invest invests in health care real estate for the elderly and people with disabilities in Belgium as well as beyond its borders. Since 2014, Care Property Invest continues its effort for the development of a new patrimony of health care real estate projects. (accommodations set out in the Housing Code) based on our experience of building service flats commissioned by the Flemish Government. Just like before, we develop these infrastructures in close cooperation with the future care provider. We finance the project and make the finished buildings available for a long period as a way of providing the necessary continuity for both the care providers and residents. WHAT CAN WE DO FOR YOUR PROJECTS? In a “Design-Build-Finance” formula, Care Property Invest is responsible for the complete project development process, from the architecture, collaboration with contractors, realisation and follow-up, to the financing of the project. How is this formula structured? As the initiator, you give a right of superficie on a building land to Care Property Invest for a period of at least 32 years. Care Property Invest develops, builds, monitors the progress of the construction works and corresponding budge and finances your project in the long term. At the provisional delivery, Care Property Invest makes the project available through a right of lease for a period of at least 27 years. After the right of lease has expired, the building becomes property of the land owner through accession. By offering the option of expanding the DBF formula with the option “Maintain”, Care Property Invest is reacting to the growing demand for the complete adoption of the real estate-related responsibilities (management and maintenance). Existing buildings, in need of a thorough renovation, can also be transferred to Care Property Invest through a right of lease, right of superficie or simply by purchasing it. 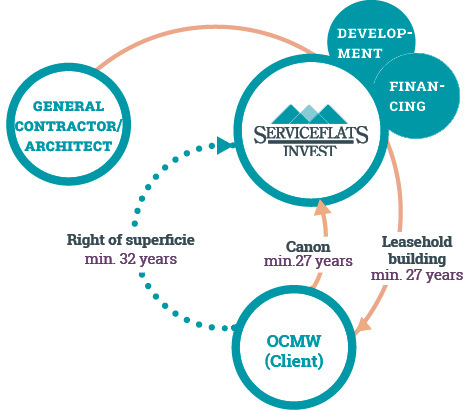 The ownership of the building is transferred to Care Property Invest (through a right of superficie or sale of the building to Care Property Invest). After renovations, the building is made available to the operator through a right of lease for a period of at least 27 years.If Care Property Invest did not purchase the real estate, it becomes property of the owner of the land through accession when the right of lease or the right of superficie expires. This could be the operator, who provided the lease or superficie on the land at the beginning of the agreement to Care Property Invest, or a third party. Care Property Invest will always make these projects available for a long period of time to operators specialised in managing residential care centres, groups of assisted living apartments and accommodation for people with a disability,… . Because each projects has its own characteristics and no situation is the same, we look forward to finding a solution fit to your particular needs. Contact our investment team now.